Added by Debra Tash on November 12, 2014. Jared Rizzi of Sirius XM was curious about the nonvoting voices Obama hears. Rizzi asked WH spokesman Josh Earnest if the president is “leader of a coalition that doesn’t vote?”. Based on Obama’s obsession with rule by fiat he does appear driven by voices that don’t vote. He insists he’ll impose immigration reform by executive action if Congress doesn’t give him what he wants right now. Speaker Boehner, a voice for those who do vote, says that would “poison the well”. Maybe well poisoning is the objective. 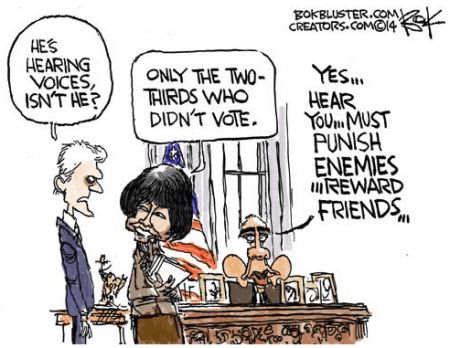 In 2010 Obama told latinos to punish our enemies and reward our friends. After all, White House Chief of Staff Denis McDonough tells us Washington would “work better if Obama has his way”.